Beloved of metal players... with good reason! 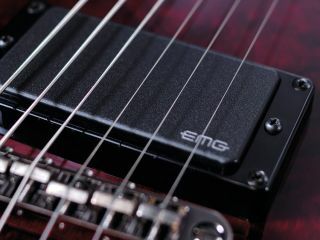 The metal fraternity is incredibly fond of EMG's active pickups. James Hetfield of Metallica, Slayer's Kerry King and hirsute purveyor of pinched harmonics Zakk Wylde all have their own signature EMG humbucker sets. Kirk Hammett is also an active EMG believer, and there are non-metal ambassadors too, such as David Gilmour of Pink Floyd, and Toto guitarist and session legend Steve Lukather. EMG's active pickup was first developed by electronics whiz kid and amp repairer Rob Turner in 1976. Its active ingredient is its built-in preamp, which is powered by a nine-volt 'square' battery and is responsible for providing most of an EMG's gain, not the magnets (as is the case with traditional pickups). Metalheads and studio players love active humbuckers in the vein of the classic EMG 81, because they get huge amounts of gain with almost zero background noise. That quietness is achieved by sealing the pickup's coils, magnets and preamp in an epoxy resin tomb. The preamp is also low impedance, so you can use any length of guitar cable, or play directly into a mixing desk or recording unit, without compromising your tone or signal strength. If you commit yourself to getting a set of EMGs, fitting them is dead easy thanks to the Solderless Install System. It's not just a clever name: the supplied components and wiring simply clip together. The tricky bit is finding somewhere to store the 9-volt battery, which can involve routing a notch in your guitar's body. If you have a Strat, Tele or Les Paul, you should have enough space in your guitar's control cavity to squeeze a battery in. That done, you can also pimp your EMG wiring loom with controls such as the Afterburner, which rolls out a 20-decibel boost (this also works for passive pickups), or run two batteries together for an 18-volt mod that provides extra headroom and a crisper tone. Not everyone likes EMGs, though. Some party poopers dismiss them as soulless. Hetfield isn't having that. While unveiling his new JH Set in March, the guitarist announced that EMG stands for 'extra metal growl'. It really means Electro-Magnetic Generator, but anyone who's ever run an EMG-equipped guitar through a raging amp will appreciate just how spot on James's definition is. Visit the official EMG website for more.